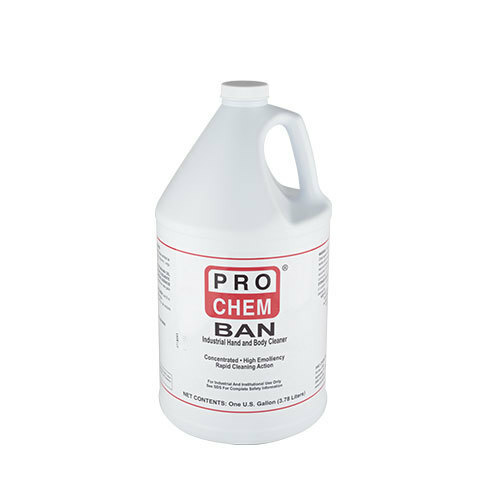 Ban | Pro Chem, Inc. This mechanic-friendly hand cleaner is ideal for use where rinsing is available and heavy duty removal is necessary. Powerful “orange oil” solvents ensure the rapid emulsification and grease cutting properties necessary to remove heavy soils. Its smooth emollient system prevents drying and chapping of the skin, yet removes the toughest of soils. Full Strength Application: Apply cleaner liberally to skin and agitate thoroughly to build up a rich, smooth lather. Continue vigorous rubbing until soil is loosened and dissolved. Rinse clean with running water. Always dry thoroughly to help prevent chapping. Due to its high activity, this cleaner can be diluted. For Economy, For Light Shop Oil: Dilute 1 part cleaner with 4 parts water (24 oz/gal). For Soap Dispensers: Dilute 1 part cleaner with 5 parts water (21 oz/gal). 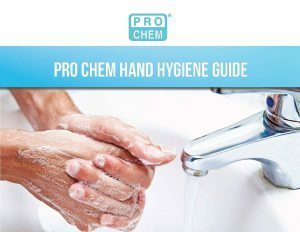 For best results, Pro Chem’s Liquid Soap Dispenser #425901 is recommended. All-Body Cleaner/Shampoo: Dilute 1 part cleaner with 7 parts water (16 oz/gal).